An excess and accumulation of fat can have very negative effects on skin and body, accelerating ageing and creating sagging of the skin, among others. Vytrus Biotech presents SARCOSLIM RE-SHAPE PRCF, an active ingredient that introduces the new concept of Liposculpture: a skin remodelling system that helps reduce fat, while taking advantage of the intercellular energy released through the burning of this fat to tighten and reaffirm tissue, so specific parts of the body can be sculpted at will. The skin acquires a younger and firmer aspect from the ‘inside’. Liposculpting is exactly what the company’s new active achieves: reshaping your curves at will, while improving your skin structure. The ingredient SARCOSLIM RE-SHAPE PRCF (INCI name: Sarcocapnos Crassifolia callus lysate), is made from totipotent cells (plant stem cells) of the endemic, and close to extinction South-Iberian plant, Sarcocapnos crassifolia, through the company’s technology platform, PLANT CELL BIOFACTORIES. This active is a metabolome rich in plant lipid management related factors (fumaric acid: skin regeneration and anti-inflammation, and isoquinolinic alkaloids: fat burning signals), specially designed to produce fat burning, and traduce it in an increase of cell energetic metabolism, and a reactivation of the mechanical properties of skin: it reduces the cutaneous lipid content, harnessing the extra energy to rebuild the skin, and to keep each curve in place. The product is Ecocert certifiable, and free of GSO, BSE, parabens, Phenoxyethanol, pesticides and contaminants. The applications of the ingredient go from reducers of rebel volumes to cellulite treatments, treatment of double chin, anti-eye bags, lack of tone, contour remodeling, smooth orange skin, firming, treatments for sagging and treatments for specific needs of neck, décolletage and breasts. In Vitro tests demonstrate the ingredient’s anti-inflammatory and antioxidant properties. Ex Vivo tests on skin explants were performed to proof its Lipolytic effect, skin restructuration and metabolic activation. There was reduction of the lipid content in both the dermis and adipose tissue, indicating a global lipolytic effect in the explants The product also shows an excellent capacity to protect and repair the dermal fibers, that guarantees a restructuring and reaffirmation of the tissue. 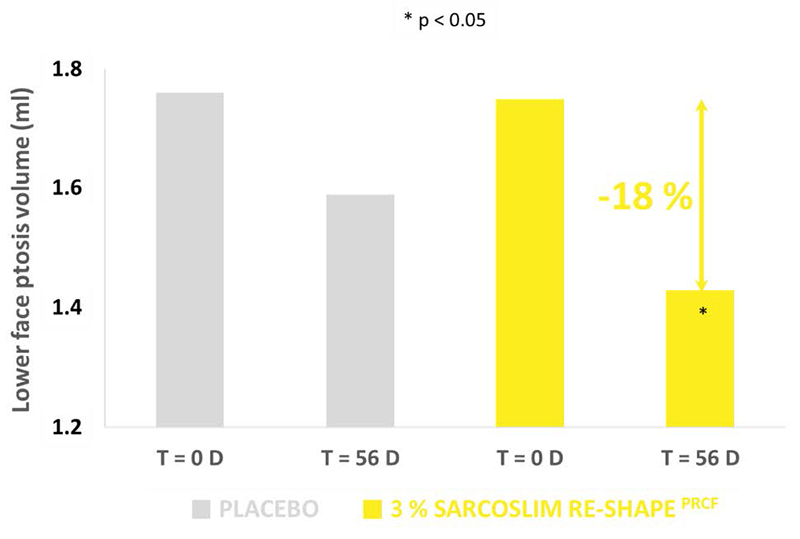 SARCOSLIM RE-SHAPE PRCF increased the facial elasticity up to +10 % in the group with NO diet, and increased the facial elasticity up to +10 % in the Diet group, both at 56 days.The same effect was demonstrated with body elasticity, that was increased up to +9.8 % in the No Diet group and up to +7.2 % in the Diet, group at 56 days. SARCOSLIM RE-SHAPE PRCF increased the facial firmness up to +7.6 % in the group without Diet, and up to +14 % in the group with Diet, at 56 days. The ingredient also increased the body firmness up to +8.6 % in No Diet group, and up to +12 % in the Diet group at 56 days. The studies demonstrate that SARCOSLIM RE-SHAPE PRCF produced significant firming and elasticity boosting effects which were equivalent in intensity both in face and body (hips in women and abdomen in men). The active ingredient is especially effective in the group with caloric restriction, where skin firming is more challenging, due to weigh loss. The volunteers were women presenting ptosis or facial sagging, and were asked to maintain stable weight without modifying life habits. Group with No Diet. 15 vol., 40-55 years old (48 ± 1), Hemi-facial application vs. placebo. SARCOSLIM RE-SHAPE PRCF showed a significant reduction of facial sagging of up to -18%*, showing a clear re-shaping effect. The measurements were done with FACESCAN, and the color codifies and defines the increase and decrease in volume. In the images it can be observed that the volume reduction indicates a more defined facial contour line, being the reduction of the volume of ptosis (ml) indicated in the blue zone, demonstrating the remodeling effect of SARCOSLIM RE-SHAPE PRCF. No Diet: reduction of tight perimeter of up to -3cm, with a significant average reduction of -1.4 cm. This test was effective in 100% of volunteers. Diet: reduction of the thigh perimeter of up to -5.6cm, with a significant average reduction of -3.8 cm*. This test was also effective in 100% of volunteers. These results demonstrate the ability of the ingredient to perform a targeted slimming effect on specific zones, and there is an effect equivalent to having done a diet of up to -3.75 kg weight loss, demonstrating the synergistic effect with diet. This entry was posted in Aesthetic Plastic Surgery, Aesthetics, Clinical Research, Clinical Trials, Dermatology on April 24, 2018 by admin. Chin implants are out, but eyelid lifts are in — the changing face of America’s $6.5 billion plastic surgery habit. Americans apparently don’t like what they see when they look in the mirror, and they’re keeping plastic surgeons busier than ever. Cosmetic surgery procedures jumped 11% in 2017, and patients shelled out more than $6.5 billion to combat drooping eyelids, sagging derrieres, plump thighs and other perceived imperfections, according to new data from the American Society for Aesthetic Plastic Surgery, a trade organization. What’s driving the boom? Some say it’s a constant need to be selfie-ready, and others have even blamed Skype for making people more appearance-conscious. Though it’s commonplace in celebrity-driven magazines and TV shows, plastic surgery is still relatively rare among the population at large: Only 4% of Americans say they’ve done it, according to a 2016 study by the Pew Research Center, a Washington, D.C.-based think tank. The procedures that saw the biggest surges in popularity in 2017 were eyelid surgery, buttock augmentation, fat transfer to the face, facelifts, and neck lifts and upper arm lifts. Meanwhile, others have become less popular. Chin augmentation has dropped 10% since 2012, and nose jobs have fallen 43% since 2000. The reason? “Women are seeing more of their anatomy because they don’t have hair blocking their anatomy,” Stevens said. The average cost for the procedure was $2,720 last year. Though the rise in popularity of Botox and other injectable treatments to smooth wrinkles can make the old-fashioned facelift seem passé , they’re anything but. The procedure jumped by 21.9% in 2017. “The facelift is not dead,” said Stevens, who’s been a cosmetic surgeon since 1986. “I’m doing more facelifts now than ever in my life. It’s more accepted in society for both men and women.” It’s not cheap — the average cost in 2017 was $7,562. Men accounted for 7.7% of cosmetic surgeries in 2017. Their top five surgical procedures were liposuction (average cost $3,279), eyelid surgery ($3,239), breast reduction ($3,779), tummy tucks ($6,083) and facelifts ($7,562). Men first started getting their noses fixed in the 1800s, particularly Irish and Jewish men who didn’t want their noses to signal “racial degeneracy,” The Conversation reported. And men were key to advancements in plastic surgery during World War I, when surgeons were tasked with reconstructing battle-damaged faces. Breast implant removals were up slightly (3.7%) in 2017, but it’s not necessarily because it’s trendier to have a smaller bosom. Most of those patients (67%) are taking out their implants so they could replace them with new ones, a spokeswoman for ASAPS said. Among those patients, 36% got bigger implants, and 23% replaced them with smaller ones. Removals cost an average of $2,745. While breast augmentation remains highly popular (it’s the second most popular procedure, after liposuction) there’s evidence that women are becoming more interested in scaling down their chest sizes. Breast reductions spiked by 11% in 2017, according to the American Society of Plastic Surgeons. “Breast reductions are consistently reported as one of the highest patient satisfaction procedures because it positively affects a woman’s quality of life. It addresses both functional and aesthetic concerns,” said ASPS president Jeffrey E. Janis. Breast reductions are also popular with men, but they pay less for it: $3,779 compared to $5,634 for women. This entry was posted in Aesthetic Plastic Surgery on April 21, 2018 by admin.